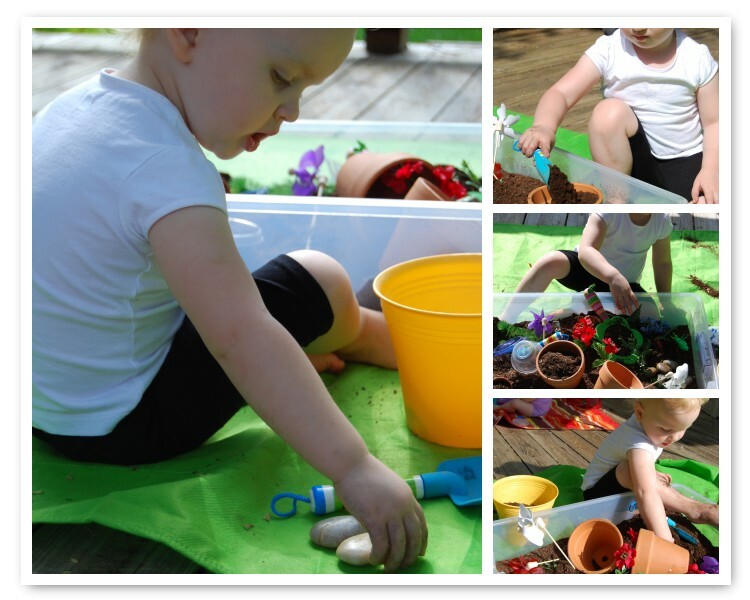 I don't have too many pictures of tot school this week because we spent most of our time working out in the garden. Avery was such a big helper! 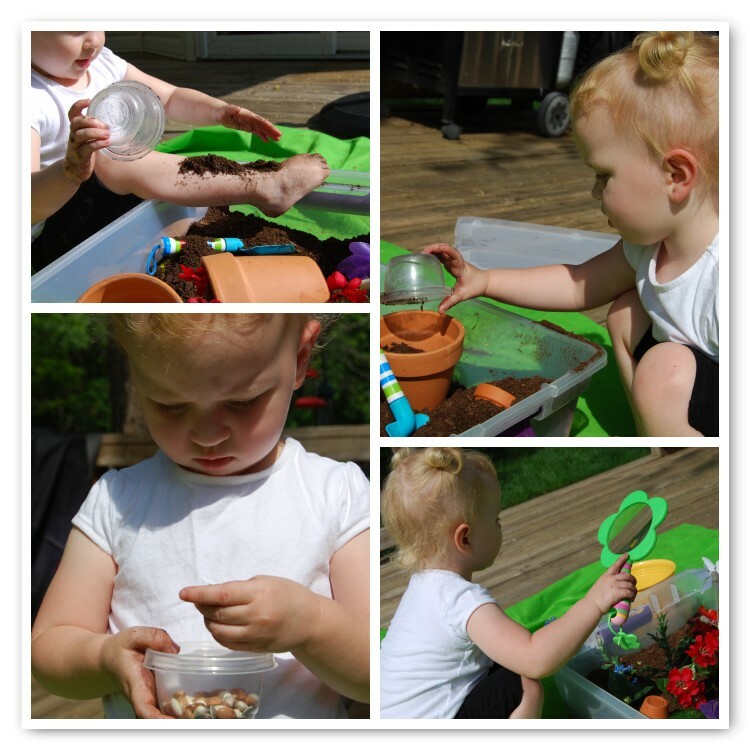 She helped me pick what we were going to grow, plant the seeds, and water the garden. In the vegetable garden we are growing cucumbers, peas, carrots, lettuce, tomatoes, strawberries (those we have had for years), broccoli, butternut squash, watermelon, cantaloupe, and a bunch of herbs. 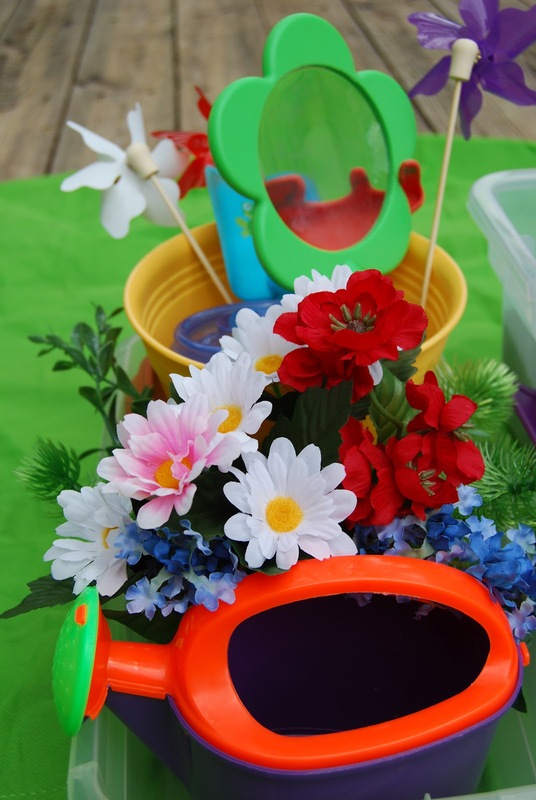 Avery also has her very own flower garden where she is growing a mix of wild flowers that is suppose to attract hummingbirds and butterflies. We did have a chance to do a couple works early in the week. Her favorite this week was a sand pouring work that we did with a funnel. 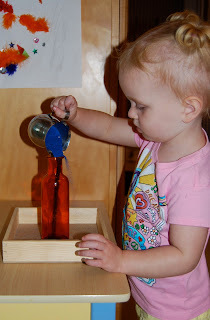 I wanted her to see that the funnel made it easier to pour the sand into a small mouthed bottle so when I gave her the work for the first time I gave it to her without the funnel. 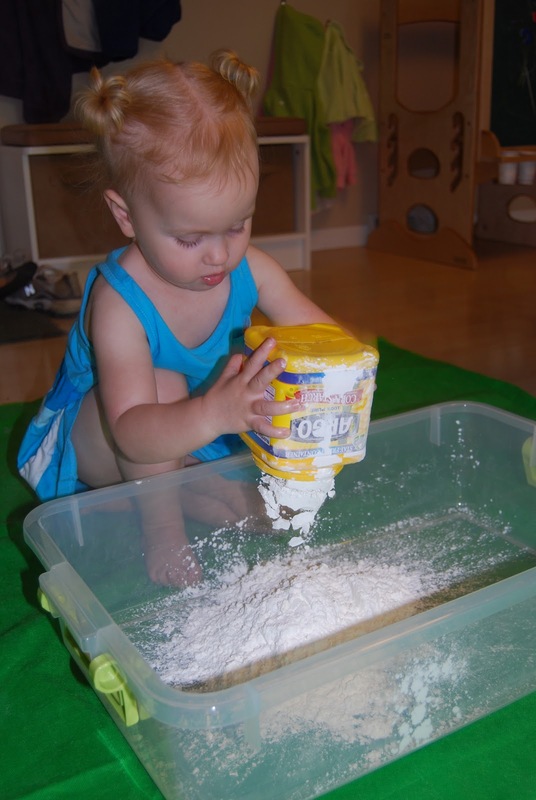 She got most of the sand in the bottle but a lot still went on to the tray. We talked about what happened and why. 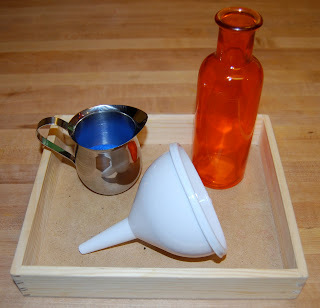 Then I gave her the funnel and let her try the work again. Afterwards, we, once again, talked about what happened and why. I think doing the work both ways really let her see and understand the purpose of the funnel. She loved watching the sand go slowly down the funnel! When I showed her the work I only used the funnel to pour the sand into the bottle. But after she did the work a couple times she told me that using the funnel would also make it easier to pour it into the pitcher. So that's what she started doing. Such a smart girl! We also did a grind work with the mortar and pestle. 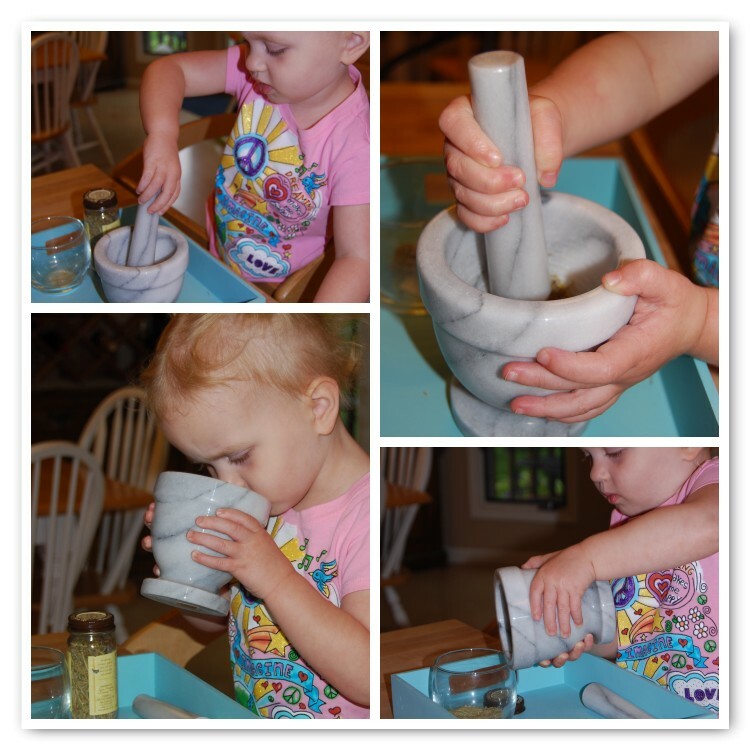 I knew I was making some rosemary fingerling potatoes later in the week so she used the mortar and pestle to grind the rosemary for me. She really liked this work also and thought that it was pretty cool that she was helping me with dinner. Pin It Now! Avery has always had several drawers in the kitchen for some of her things but for the past few months I have been meaning to give her even more space. So, when we got new dishes I decided it was the perfect time. We ended up moving all of her things to the bottom 2 shelves of the pantry so now she can easily get everything she needs. The bottom shelf has 3 baskets, one for her plates and bowls, one for cups and snack traps, and one for silverware and lids. 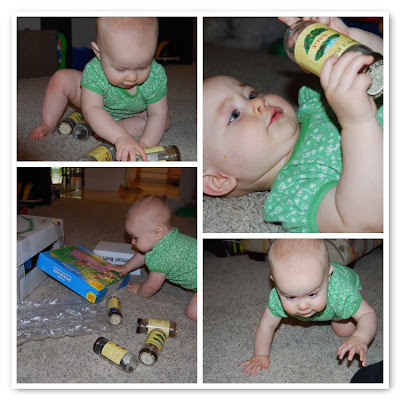 There is also a basket with the pouch baby foods that she still loves to eat and calls applesauce (no matter what flavor) plus a couple other snacks that don't fit on the shelf above. The items on the right hand side are not Avery's but everything else is. She has a basket with all the individually wrapped snacks (granola bars, fruit chews, fruit bars, etc.) and then easy to open and close containers that contain all of the loose snacks (pretzels, veggie chips, Cheerios, dried cherries, etc.). There's also a box of her oatmeal. It has been working out GREAT! At breakfast she gets her own bowl and spoon, then gets a packet of oatmeal (if that's what she's having). She needs help opening the oatmeal packet but then she pours it into her bowl and mixes it up. I'll tell you more about lunchtime but that will be it's own post later on. For snack, she can get her own individually wrapped snack or she can fill her own snack trap. One of her favorite things to do right now is make trail mix. She'll pick out 2 or 3 different items and take a handful of each, adding it to a snack trap and then mixing it up. She loves doing it and it makes snack time so much easier! 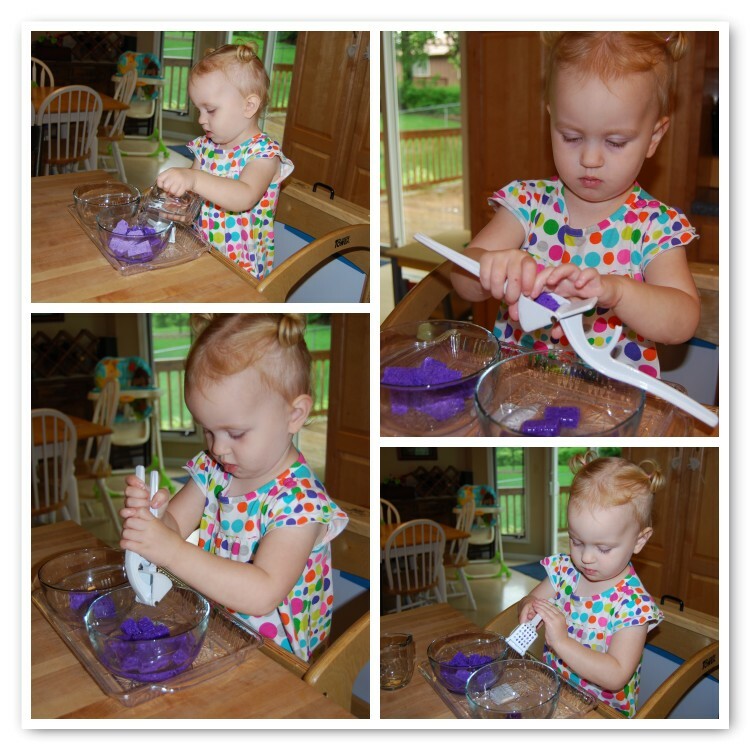 I love that it teaches her how to be independent, helps increase her confidence, and gives her an opportunity to practice some practical life skills. It's not nearly done but it's definitely a start and beginning to feel more like a Montessori kitchen! The next thing I would like to tackle is making the switch from plastic dishes to glass ones. I just have to talk Eric into letting her use our new dishes! This week we did a garlic press and sponge work that Avery loved. She asked for it several times this week and wanted to show daddy her work when he got home that day. We also did a work with magnets. 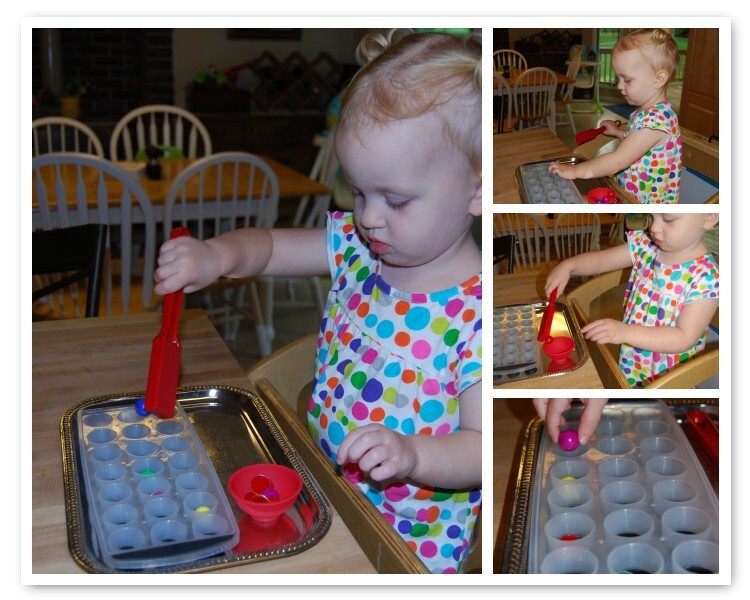 She put the magnetic marbles and disks into the tray then used the magnet wand to get them out. The holes were small enough that it was really hard for her to get the marbles and disks out with her fingers so the magnet wand made it much easier (exactly what I was hoping for). I wish I had enough magnetic marbles to use only them instead of the magnetic disks too, but oh well, it still worked great and she loved it. I finally got to show her our new sensory tub this week. 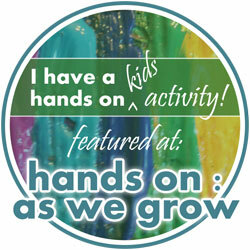 I made it last week but it had been raining so much that we hadn't gotten to go out and play with it yet. 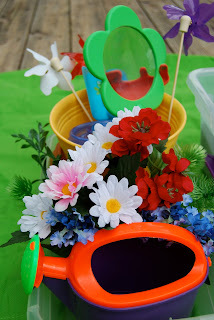 It is a garden themed sensory tub. Here's the post I did on it in case you want to check it out. She loved it! We also did a construction paper cutting work that was a little difficult for her at first but ended up being her favorite. She has spent so much time on this one and is improving so much. This is usually a fall work but I was getting some cinnamon in the bulk section at the grocery store last weekend and caught a whiff of the cloves, I just couldn't resist. I cut some slits in the rind of the orange and then she stuck the cloves into the slits. This was probably her least favorite, it didn't really hold her attention for too long but it smelled wonderful. 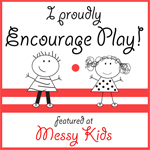 My favorite thing we did this week was start our adventures in messy play. 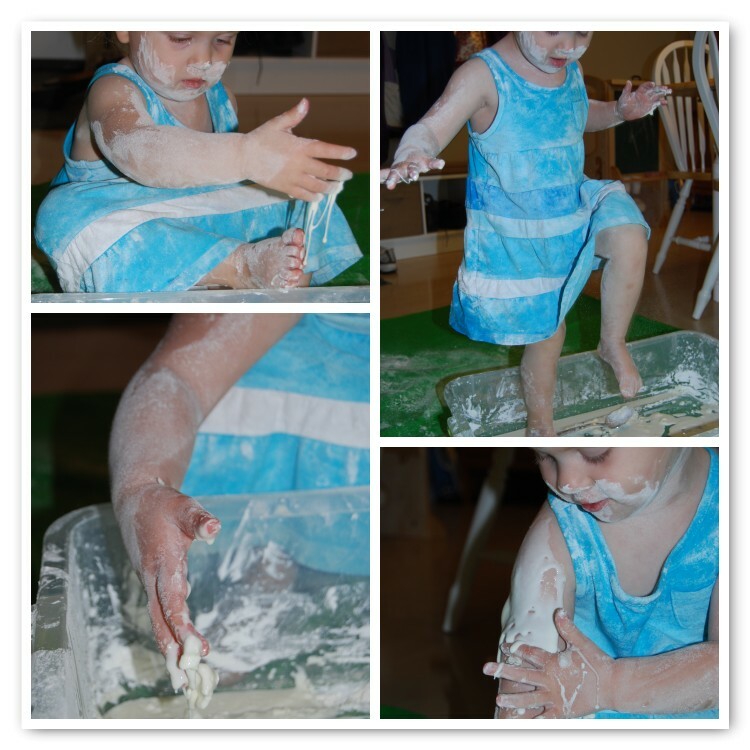 Avery made her own Oobleck and it was a whole body experience! 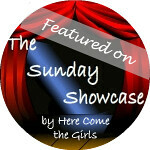 Check out this post to see what we did. 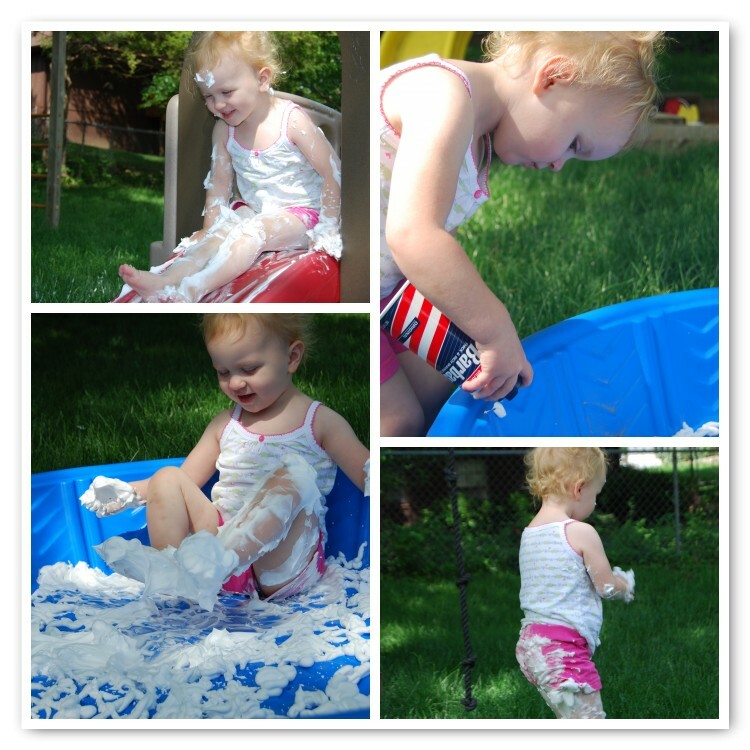 Also played with a kiddie pool of shaving cream! See what we did here. With Parker, we started out playing with some old spice jars that I put different object in: pony bead, flattened marbles, small pinecones, water bottle lids, and beans. We then added a couple card board boxes and a sheet of packing material. The picture in the bottom right hand corner shows what happened every time I picked up the camera. The second I started taking a picture she would drop what she was doing and make a bee line for me. 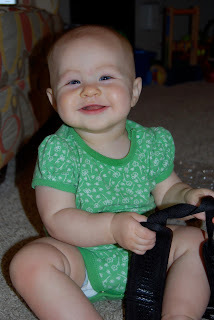 I couldn't figure out what she wanted but eventually I realized it was the strap of my camera she was after. I unhooked it from my camera and let her play with it, she loved it! After she investigated it for awhile, she was then happy to go back to exploring the other items. 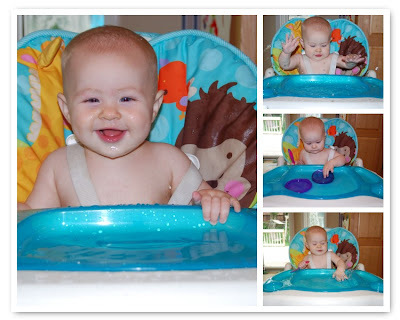 We also turned her high chair into a baby water table. She had such a great time splashing and playing with the water! 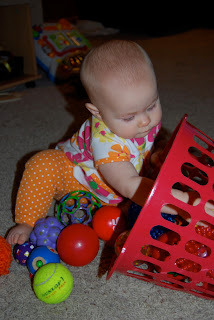 Still loving the ball treasure basket! 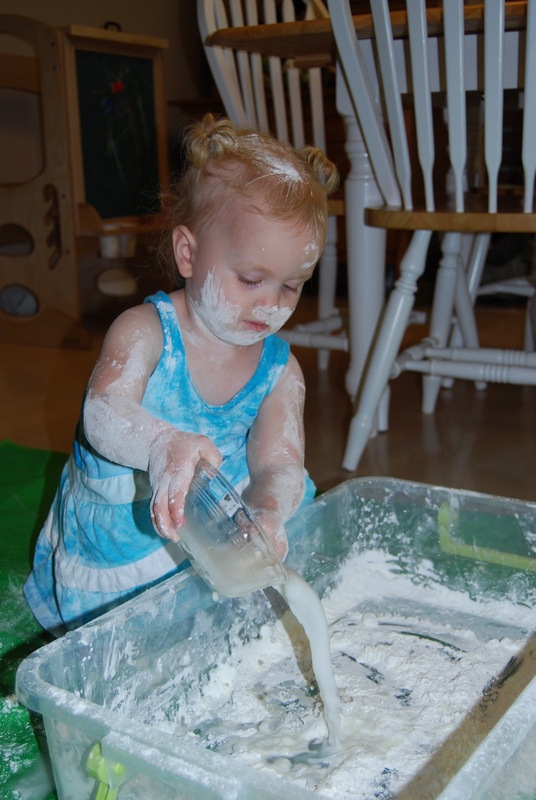 I wasn't planning on doing any more messy play this week but plans changed Friday after nap. Avery woke up really early that morning and was not in a good mood all day. Nothing held her attention during Tot School, she was really fussy and whiny, and when she woke up from nap and immediately started crying I knew we needed to do something special. 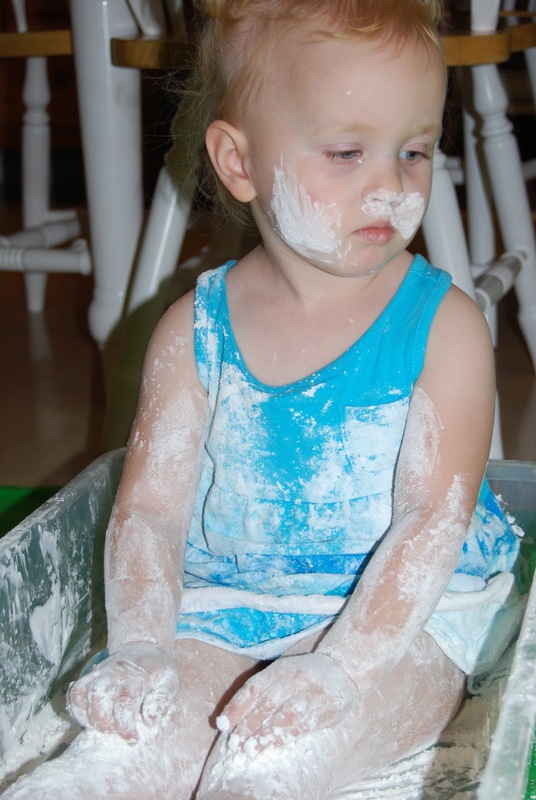 And there's nothing like a little messy play to turn a bad mood around. Since it was a last minute kind of thing, it needed to be something easy that I had on hand...so shaving cream it was! We have played with shaving cream quite a bit and it has always been messy but we have never done it as a whole body experience like I wanted to this time. 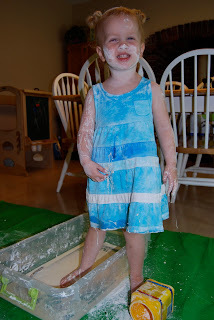 The day before I had bought a couple kiddie pools for our upcoming messy sensory play date and decided it was the perfect time to break one of them in. We put the pool out in the yard and emptied an entire can of the shaving cream it to. It was quite a bit but I think it would have been fun with more, next time I will probably use 2 cans. We pulled her little slide over and she had fun sliding into the pool of shaving cream. 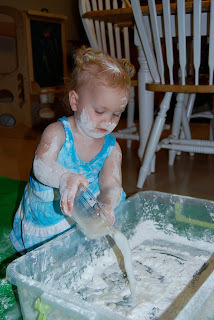 After a while Avery asked if she could add some sand from her sandbox into the shaving cream. 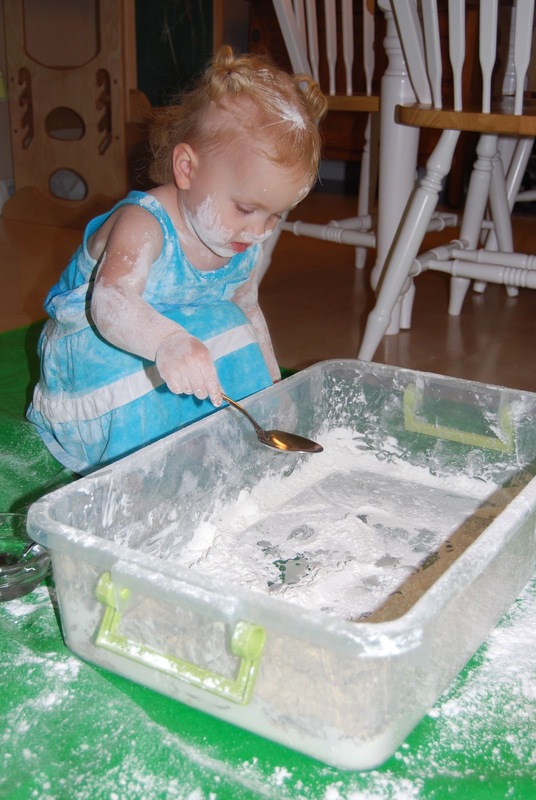 She also turned the slide into an easel and drew pictured in the shaving cream/sand mixture. Another successful messy play and it greatly improved her mood for the rest of the day! I have a new obsession: messy sensory play! While looking around Pinterest I was taken to the blog Growing A Jeweled Rose and feel in love with all her awesome ideas. 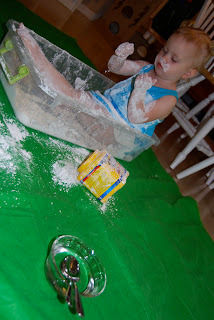 She does a monthly messy themed sensory play date that is so cool! As soon as I saw it I knew it was something I wanted to start up. So, in June I will be hosting a messy sensory play date for my mom group and I can't wait! Until then, Avery (and maybe Parker a little, too) will be doing research to decide what we want to include in our play date! 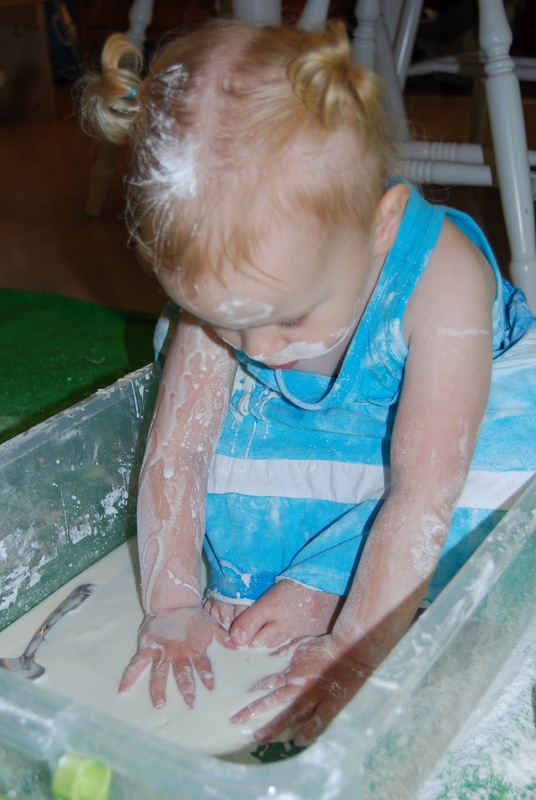 We started out with Toddler Made Oobleck. Now, we have played with oobleck before but I approached it a little differently this time. First, I wanted her to experience all stages and phases of it. Second, I wanted her to get into it, literally! So instead of letting her explore pre-made oobleck in a bowl on the counter, I gave her an under-bed storage container and a box of corn starch. I didn't tell her what to do with it, I just let her explore it however she wanted. 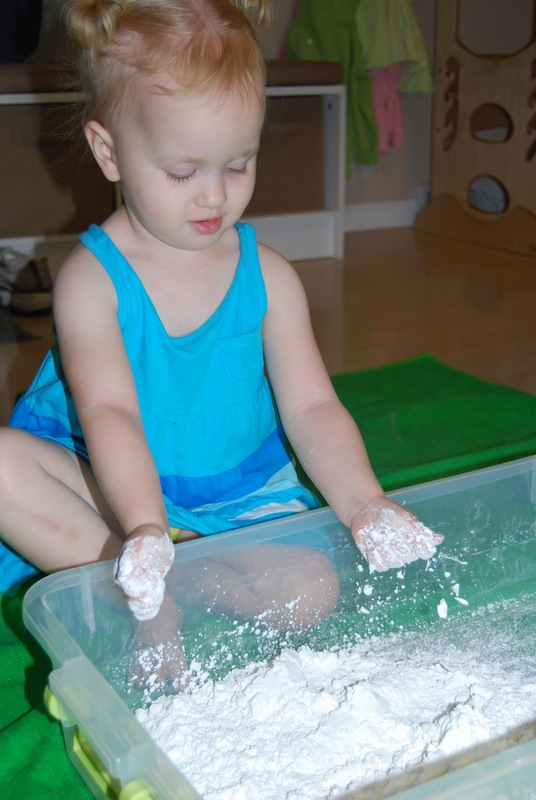 She spent a good 30 minutes with the corn starch alone! She immediately dumped out the whole container! After she played with it for a while, we talked about what it felt like. It was a wonderful opportunity to introduce some new vocabulary words. 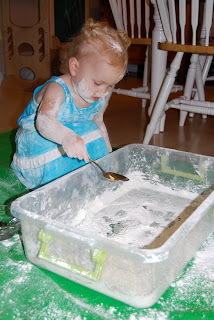 She thought it was really cool that she could draw/write in the corn starch. She started out just drawing shapes and lines but then decided to practice her letters. After that she decided it was time to get in. At one point she told me "I want corn starch on my tummy" and proceeded to lie down in it! Next, I simply put out a bowl of water but didn't say anything. She wasn't that interested in it at first, she would just keep looking over at it. But after a while she finally started adding it to the corn starch. She started out adding one spoonful at a time but finally decided to pour the whole bowl of water in. And just like before, she had to get into the container! Boy did we have fun!!! 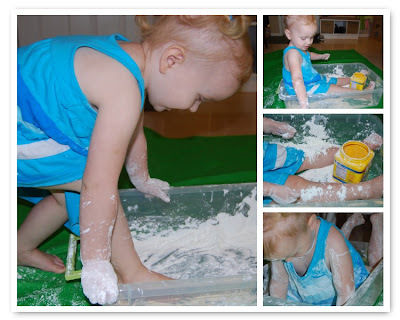 Can't wait to do our next messy sensory play! 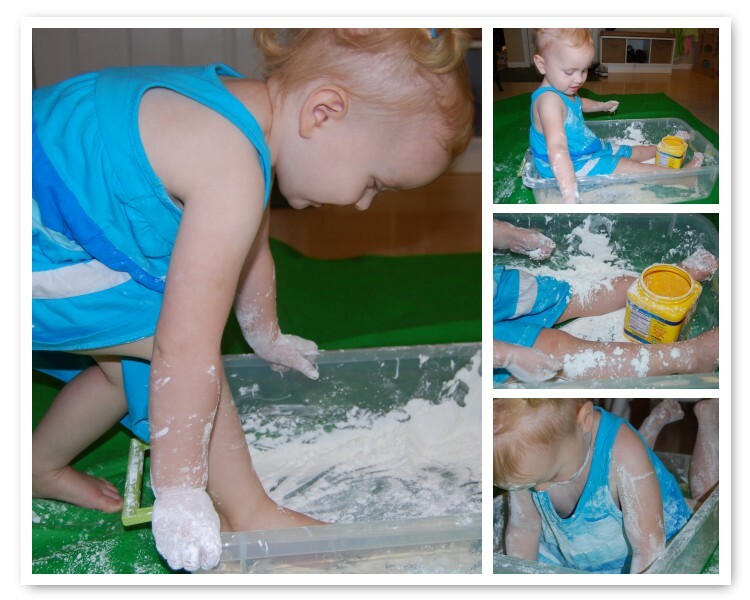 Do you have any fun messy sensory play ideas? I'd love to hear them! With May's arrival, it was time for a new sensory tub! After nap I took Avery outside and presented it to her just like the above pictures. I wanted her to start out with just the potting soil in the tub so that she was free to play with it however she wanted and so she wasn't influenced by anything. She had so much fun! 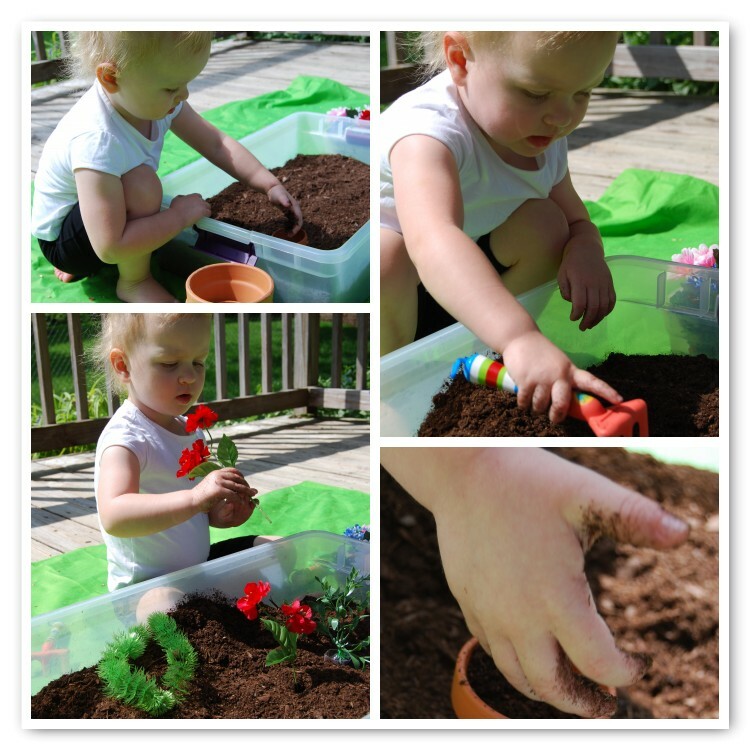 She spent a long time just playing in the dirt before she even touched the garden supplies. But by the end, she had explored everything! Can't wait to see what she does with it next time!